Why Isn't My Rule Firing? How Do I Copy Repeating Data From an External Source into My Form? As you can see, there is a one to many relationship between the xml files. Each vehicle may have any number of dealers. 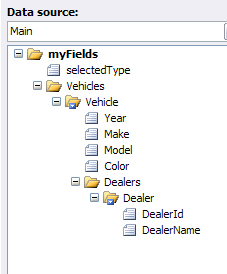 Add a repeating table connected to Vehicle in the main data source, and a field that will display dealer information in a repeating section in that table. Right-click the Add Rows button, and, under Button Properties, select the Edit Form Code button. Microsoft Script Editor or VSTA will open, depending on what programming language your form is using (this can be changed under Tools/Options/Programming). // Get the selected vehicle type. // If no form was selected notify the user. // Get the list of vehicles per the selected vehicle type. // If nothing was found, then return; there will be no items to insert. // Get the Vehicle insertion point. // Add the rows to the main DOM. // Get this vehicle's values from the secondary DOM. // Build a string representing a main DOM vehicle nodeset using the values from the secondary DOM. var vehicleXml = "<my:Vehicle xmlns:my='http://schemas.microsoft.com/office/infopath/2003/myXSD/2008-06-03T00:09:57'>"
+ "<my:Year>" + year + "</my:Year>"
+ "<my:Make>" + make + "</my:Make>"
+ "<my:Model>" + model + "</my:Model>"
+ "<my:Color>" + color + "</my:Color>"
// Get the list of Dealers for this vehicle. // Add the dealer rows to the XML. + "<my:DealerId>" + dealerId + "</my:DealerId>"
+ "<my:DealerName>" + dealerName + "</my:DealerName>"
// Load new vehicle string into a temporary XML DOM. // Insert the new vehicle into the main DOM. //Get the Vehicle insertion point. //Add the rows to the main DOM. string vehicleXml = "<my:Vehicle xmlns:my='http://schemas.microsoft.com/office/infopath/2003/myXSD/2008-06-03T00:09:57'>"
Your form is now ready to try. Preview it, select a vehicle type from the drop-down list box, select the Add Rows button, and your repeating tables should populate with the correct data from your secondary data sources. Thanks for the tutorial Hilary. While I was testing out your example form, I noticed that your are able to select the same vehicle type & insert the vehicle's data into the repeating table as many times as you want, by pushing Add Rows. I would like only for my form user to be able to select the "vehicle type" once, prefill the repeating table rows with the vehicle's data by using the Add Rows button, and then the user will not be able to select that particular "vehicle type" again. Can this be done? And if so, how? Thak you so much for this very helpfull article. Now i have a question to you...here i see you doesn't use the existing first blank row. have any process to use this first blank row..??? if have any......please reply me. This is exactly what I need, with one small problem. All of the code in my forms is vbScript, and secondly I'm stuck in Infopath 2003. Can this still be done? As to RhysAZ's question, you'd need to add a filter to the list so it didn't display anything that had previously been selected. Previous-sibling can help with that. To riaz secl -- just don't include the blank row by default -- you'll find this under the default values. And to Derek -- the jscript sample is for IP 2003. You'll just have to translate from jscript to vb. Hi...I'm afraid I cannot seem to find anybody that can convert the jScript to VB, is there anybody around here that might be able to do so? What about changing your form to use JScript instead of VB? Or do you alread have VB Script in your form? I have an infopath form and I want to display top 3 values from secondary data source in a repeating table. I will select a name from drop down and it should display only top 3 rows and not all from database on infopath repeating table out of many in database. How can it be done. This tutorial was of great help to me. Thank you Hilary! string vehicleXml = "<my:Vehicle xmlns:my='schemas.microsoft.com/.../2008-06-03T00:09:57'>"
I hope you can help me, I am new to programming. I have a similar situation with an InfoPath 07 form that is pulling from the SharePoint 07 form library (Second Data Source) that it submits to. On a change request, one can select a specific docId and prepopulate the new form with data from an existing form. Of course, the repeating section does not prepopulate. I merged the data and then published it back to sharepoint. I could tell it is trying to read something, but I pretty much ruined everything good that I had going on. So, not only do I submit my form data to SharePoint, but I also submit the form data as XML to SQL Server which is where I generate my docId. I'm not sure how to reference my XML in the database from the code. Nor do I know how to extend the repeating table, using code (c#). The above code looks helpful, but I have no idea what its trying to tell me and I know my situation is a bit different than what is explained. Could you please guide me in the right direction and/or maybe point out specific areas that would be helpful to me? // Write your code here to change the main data source. Hey, Kourtney - so you are getting the null ref exception when you follow the full tutorial? You aren't trying to use this code in a form with a different schema, right? what i do, for delete or elimate this symbols (4;# - 9;# - ....) ? I would be grateful, if you could guide me on the following please (this may already have been asked before). I am new to InfoPath and designed forms which Submit to one row in SQL table. My question is, Is there any way that I can store information to multiple rows in SQL table? If yes than which components should I use? I wandered into development after working as a business process analyst for a global manufacturing company. I create InfoPath solutions for our clients as well as work as a developer on company tools that extend InfoPath. I've also been instrumental in creating the InfoPath Master Class training provided by Qdabra.